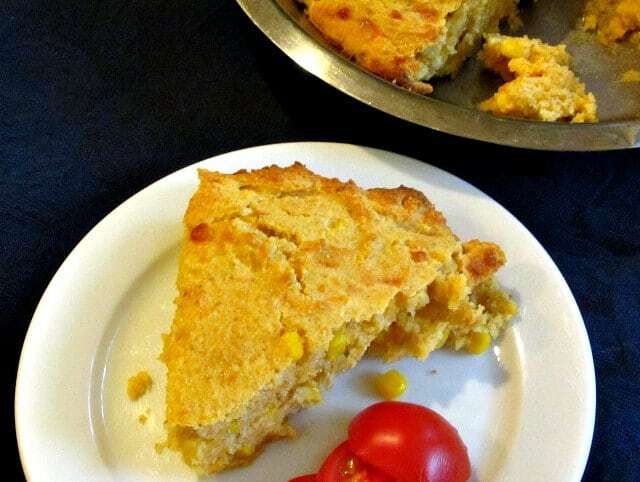 Add corn and cheese to cornbread to make Corny Cheesy Cornbread – a terrific side dish that’s interesting in itself, without overwhelming your main dish! 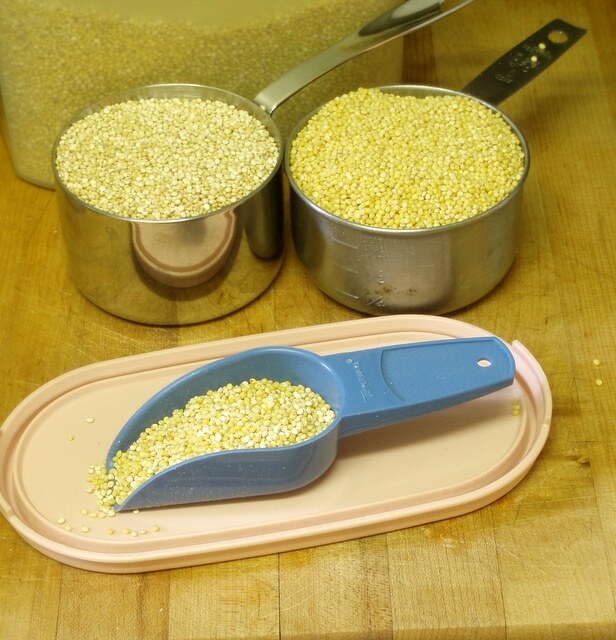 Anyone who has read this blog for a while knows that Rich and I have eaten quite a lot of brown rice over the years. 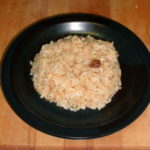 That has been my default Complex Carb (I hate talking in that reductionist way, but there you are – for me, a meal has to have Protein, Vegetable, and Complex Carbohydrate…) We do eat other things, but especially when I talk about putting a whole meal together, I tend to blithely tell you that I served it with brown rice. It’s easy to just have a routine. I mean – they’ll eat it and all… but they see rice as sort of boring, rather than as a staple. (Years ago they ate bread at every meal, which I thought was boring and they saw as a staple. It’s all what you are used to…) So they sort of poke at it, and it colors the way they see the rest of the meal. And my goal here is to give them good, nutritious and tasty food – I want them to get plenty of good nutrition, sure, but I think they have to enjoy their meals. And I made my Corn Muffin Mix. I haven’t been making muffins for breakfast – still trying to work out the timing of that, and may just end up making them the night before and accepting that I don’t get fresh muffins in the morning. 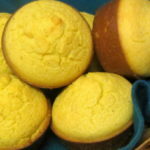 But I have made muffins and cornbread for dinner – and everyone is quite happy indeed about that! Especially when I fancy it up a bit, and they have a real treat. And I use just a touch of spice here, which is all we want if I serve it with a spicy dish and want the bread to balance. If you serve it with unseasoned meat or fish and want the bread to add interest to the meal, by all means increase the spice, especially the chili pepper… But, for instance, the night I actually made the bread in the pictures I served it with a recipe using country sausage and didn’t want the bread to clash with or overwhelm that. Use your own discretion. Mix together the dry ingredients. I use 225 grams of my Corn Muffin Mix which I highly recommend, especially if you are gluten free – but it’s good even if you aren’t… If you want my recipe but don’t want to make the whole mix, the original recipe is here. That’s enough mix for one recipe for six muffins… so if you have a recipe you prefer you can use that – but make sure you’re just making six muffins worth, or double it (and be sure to also use the correct amount of egg and buttermilk.) You can even use the ubiquitous blue boxes which I cheerfully admit were a staple in my kitchen before I learned that I needed to avoid gluten – one of the only mixes I ever used. But really – the mix recipe makes enough for six batches of six muffins, so it’s really not an overwhelming amount… make this tonight and a dozen muffins on Saturday, and you’re already used half of it. So put your mix in a smaller bowl, and blend well with one teaspoon of ground cumin and half a teaspoon of New Mexico Chili Powder. 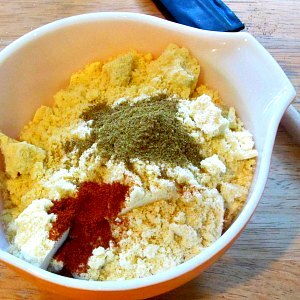 Or whatever pure chili powder you have on hand – chipotle or even hot Spanish Paprika would also work well, and give a slightly more complex flavor. And as always, you may want to change the amount of the spice – but I suggest making it as written first so you see the levels. Now – if you choose to use your own recipe for cornbread – mix the dry ingredients with the spices first, then make sure you remember your oil in the second stage! I don’t need to add it here, as it is already in the mix… And you might want to start with one cup of buttermilk, then add more as needed – slightly different amounts of slightly different flours will affect that measurement. And obviously I have not tested any such variation – but I know some of you will want to do that, so… go for it, here are my suggestions, but I make no promises! 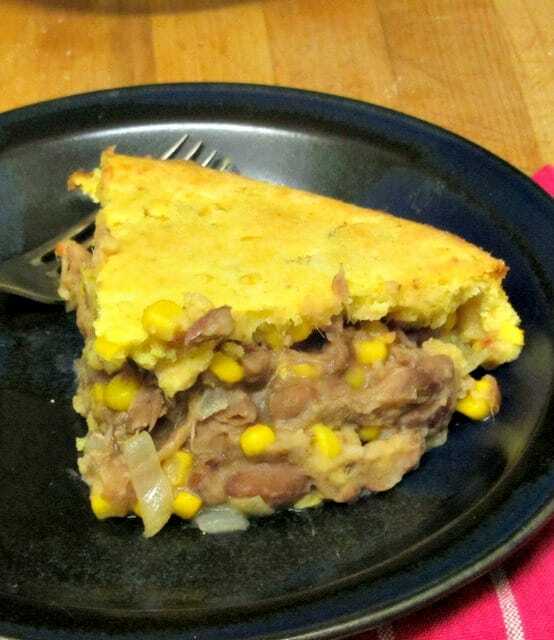 Corny Cheesy Cornbread complements chili particularly well, of course, but it also goes well with other bean dishes, or even a simple unseasoned pork chop or fish. And the parents don’t think it is boring at all! Blend corn muffin mix and spices in a bowl. In a larger mixing bowl, beat the egg, then add they buttermilk and blend it well. 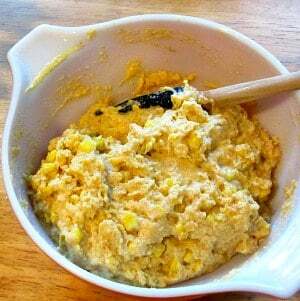 Mix in the seasoned cornbread mix to make a batter. 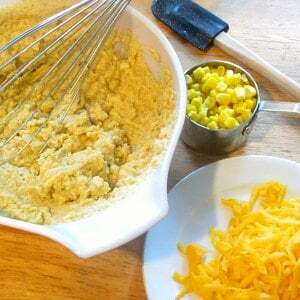 Then fold in grated cheese and corn. Mix well. Pour the batter into a baking pan, and bake at 425 for 25-30 minutes, until a knife inserted in the center comes out clean. Let rest five minutes, then serve. I love making cornbread in my cast iron skillet! I find it is like a blank canvas for flavors and mixing in various spices and cheese is fun. This recipe sounds so tasty! We are huge fans of homemade cornbread. Whole corn isn't something we usually add, but it would be a great addition. Cheese is always a must!! This is definitely a recipe that my family would love! I hear you about the parents. They are set in their ways. Love that you have taken the mix and spiced it up.Keeping the recipe easy and delicious. Now, that's just corny. Seriously, this sounds delicious. It would be so good with a bowl of chili! It's always nice to have a new side dish recipe. All too often all the focus is on the main, and the sides are boring. This one looks yummy! I love that there is corn in this recipe too! Saving this one to make real soon. 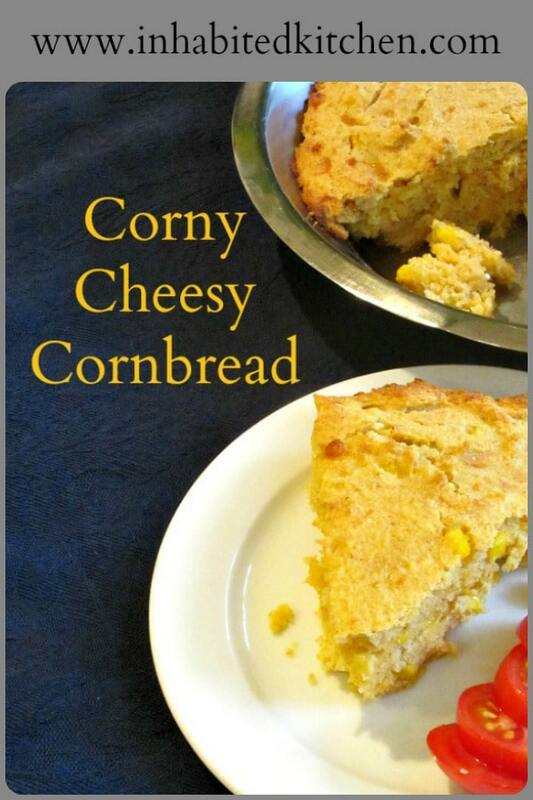 I was just thinking about how much I love cornbread and then I came across this cheesy cornbread recipe. I think it's a sign I have to make it! Gorgeous! Super easy recipe and love that it's made in a baking pan. Perfect recipe for a classic favorite! I love love love cornbread! This recipe is perfect for my family and having friends over. Sounds so yummy!